Over the past few years we have been developing a system of feeding chickens and pigs which efficient and applicable for farmers without access to commercial mixed feeds. The system is based on a choice feeding ration which allows the animals to select the foods which best suit their requirements. 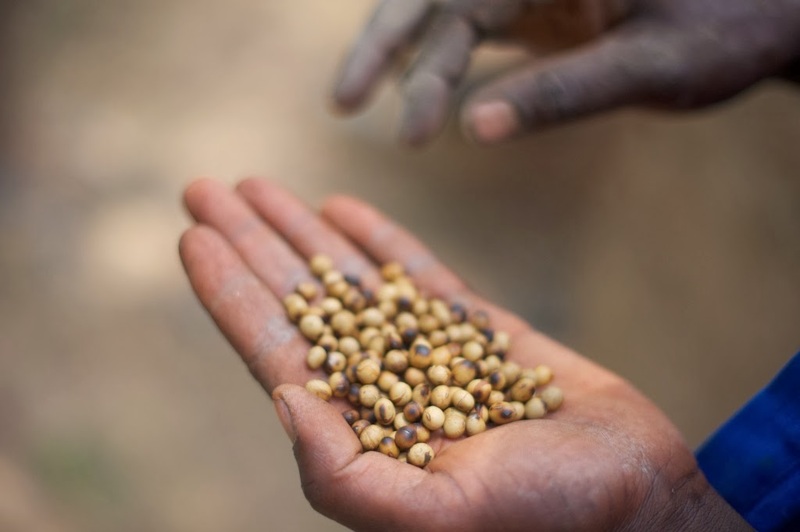 In advanced commercial systems, animal diets are predicted for each stage of growth and feed mixes vary according to predicted needs.Â Our system allows small-scale farmers to replicate this without the need for grinding or mixing equipment.As the majority ofÂ livestock feed for pigs and chickens in this part of the world consists of maize and soya bean, which are two crops which can be grown under rain fed conditions, these two crops constitute the bulk of the diet. Soya beans are roasted in a half metal drum under a fire to eliminate the soya beans natural insect repellant – trypsin inhibitors. The heating de-natures this compound and allows the animals to consume large amounts of soya without adverse effects. A fuel efficient soya bean roaster made with mud bricks and a half metal drum. Batches of 10-15kg are roasted at a time. Roasting takes approx. 15minutes. CareÂ must be taken when roasting the beans. 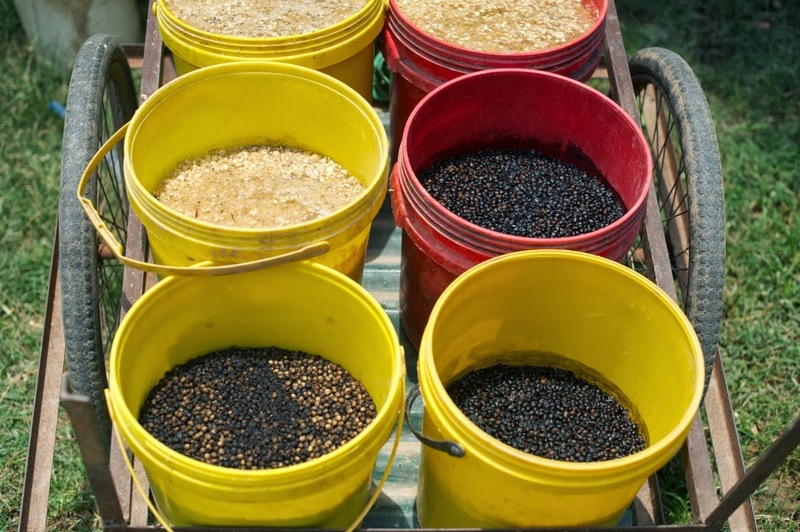 Eating the beans is the best way to test if they are satisfactory for consumption by livestock. The ‘beany’ taste associated with raw soya should be completely gone and they should taste more like roasted peanuts. In order to balance the dietary needs of the animals, limestone, di-calcium phosphate, salt and for the early stages of growth fishmeal, are mixed in appropriate ratios and given separately in the case of layer birds and mixed with the soya beans just before feeding in the case of pigs and broilers. 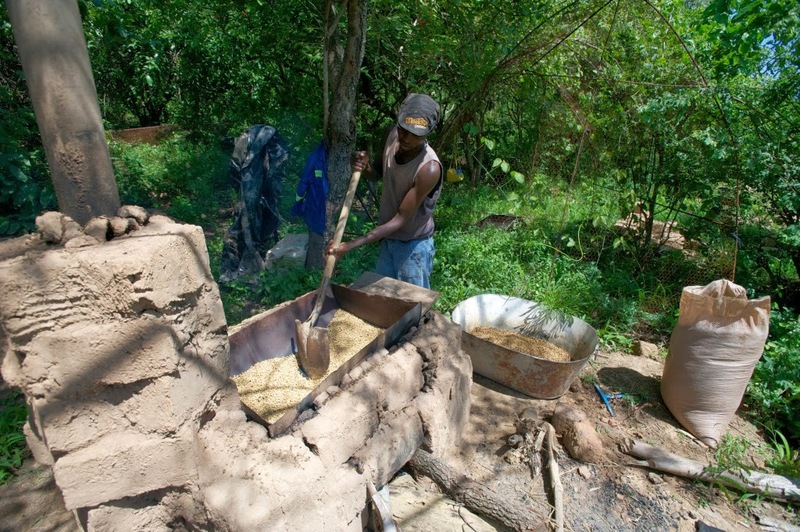 However, for smallÂ chicks maize and roasted soya are milled to a coarse grain in a hammer mill with the sieve removed. A starter mix is made and maize is given to the birds in order to supply them with an option for high protein and high carbohydrate. Layers are given whole grain diets after around 3 months. All the farm animals are fed grain at 16hrs daily, only once. This is done to allow the digestive system to rest for a period. This is said to promote a healthy digestive system. For both pigs and chickens are allowed the ‘free choice’ feeding and continuously monitored for their intake of hi-carb and hi-protein. The feed is adjusted according to demand by looking at the appetite of the animals for both feeds withinÂ a 2 hour period. ie. if they finish the maize quickly, more maize is given on the following day. If the roasted soya is consumed more quickly this suggests the animals need more protein. We are very happy with the results of this type of feeding as it allows us to match the dietary requirements of the animals with minimum cost for labour/transport/milling and mixing.